my bare cupboard: Baked pulled chicken sliders ( with homemade brioche slider buns ) "
Let's take a break from baking cupcakes , shall we ?! I've made these sliders few days ago and everytime the recipe works really well , okay , with some tweaks , I ask myself , why didn't I make this before ?! The recipe is quiet straightforward except for a long list of spices , which if you like to cook , can be found lurking in your pantry . I never had this kind of spice rub before and the flavor and smell of the grilled chicken reminds me of some Indian-style dishes , it's the cumin , I think . Or nearly like a simple Mexican-style spice rub . For the sauce , I didn't go overboard with chillies as one of my test tasters doesn't like too spicy food . Though the grilled chicken was a bit spicy , the spiciness is muted when you add it to the sauce . The grilled chicken on its own tastes so delicious that I've eaten nearly a whole piece of it before adding the rest into the sauce ! If only I had some leftover rice at that time ! If you don't like to shred the chicken , you just can cut it into 4 slices ( depending on the size ) and toss it with the sauce or brush the sauce all over the chicken . Don't forget to make the simple cabbage slaw as it adds a delightful crunch to these pretty awesome sliders ! * To prepare chicken : Combine the first 6 ingredients and rub evenly over chicken , set aside . * Line the roasting pan or rimmed baking sheet with foil ( to catch the chicken drippings ) and preheat oven to 400°C . Place chicken on the highest wire rack ( I'm using a tabletop oven ) and grill chicken for 20 minutes , 10 minutes on each side . Let stand for 5 minutes then shred with 2 forks . * While chicken is grilling , prepare the sauce . Heat oil in a saucepan over medium heat , add onion , cook for 5 minutes , stirring from time to time . Stir in the sugar , garlic , mustard , chilli flakes and allspice powder , cook for 30 seconds . Stir in ketchup and vinegar , bring to a boil . Reduce heat and simmer for 10 minutes or until slightly thickened , stirring occasionally . Stir in the shredded chicken and cook for another 2 minutes , take pan off heat . * This pulled chicken is more than enough for the brioche recipe below . * In a mixing bowl , whisk together the flour , sugar and salt then add in the yeast and give it a good stir . Make a well in the middle of the flour mixture , pour in the milk and the eggs . Mix together using a wooden spatula until it forms a very wet dough . Transfer to a clean work surface and knead for 5 minutes , the dough will be very wet . Add in the butter and continue to knead or slap ( onto the surface ) the dough for 20 minutes until dough is smooth and elastic or do a window pane test . The dough is still tacky so , sprinkle some cake flour onto the work surface and on top of the dough and form into a ball . Transfer dough into a lightly-oiled bowl cover with plastic wrap and proof for an hour at room temperature . Put dough into the fridge and let it rise overnight . You can still proceed to divide the dough after it doubled in size and bake it on the same day but it is easier to handle a well-chilled brioche dough especially if the weather is warm . * Take out brioche dough from the fridge , dust work surface and your hands with cake flour and weigh dough ( my final dough is 582 grams ) , 9 pieces at 50 grams and 2 pieces at 66 grams and form into small balls . Lay each dough on a baking sheet lined with parchment . Cover dough and let proof for about an hour , depending on the warmth of your kitchen , or until doubled in size . * Meanwhile , preheat oven to 180°C . 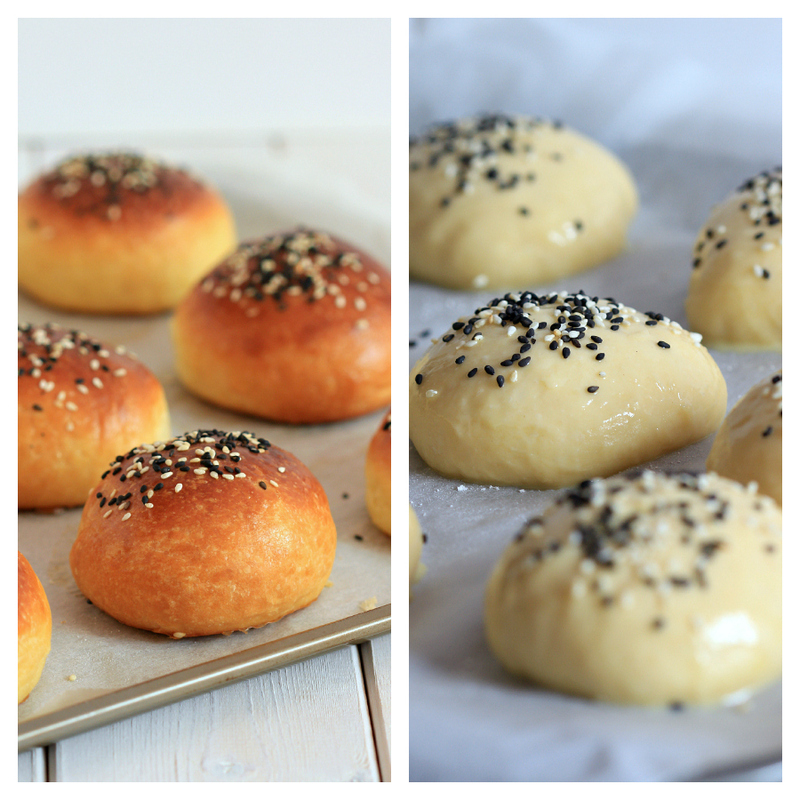 * Brush top of the buns with egg wash and sprinkle with black and white sesame seeds . Bake for 20 minutes , take out buns and let cool on the wire rack . * Whisk together 3 tablespoons mayo , 1 teaspoon apple cider vinegar , 1 teaspoon sugar , 1 teaspoon light brown sugar , a dash of ground white pepper and a generous pinch of salt . Pour dressing into 2 cups of shredded cabbage ( green and purple ) and carrot , toss to coat , chill in the fridge before using . * Cut several pieces of brioche buns into half , toast , cut side down , into a heated pan until it turns lightly brown . 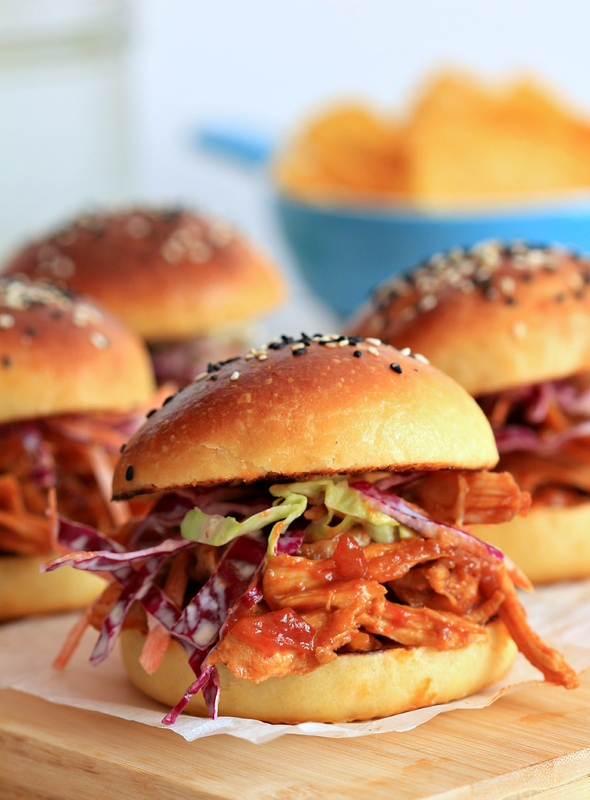 * Place some pulled chicken on the bottom half of the buns , add in the slaw then close the sliders . Serve with chips or fries and juice or soda . You can always make me hungry!! I think I would take this over a cupcake right now! WOW, that sure looks scrumptious! From the buns to the chicken, everything looks delicious! These look amazing! 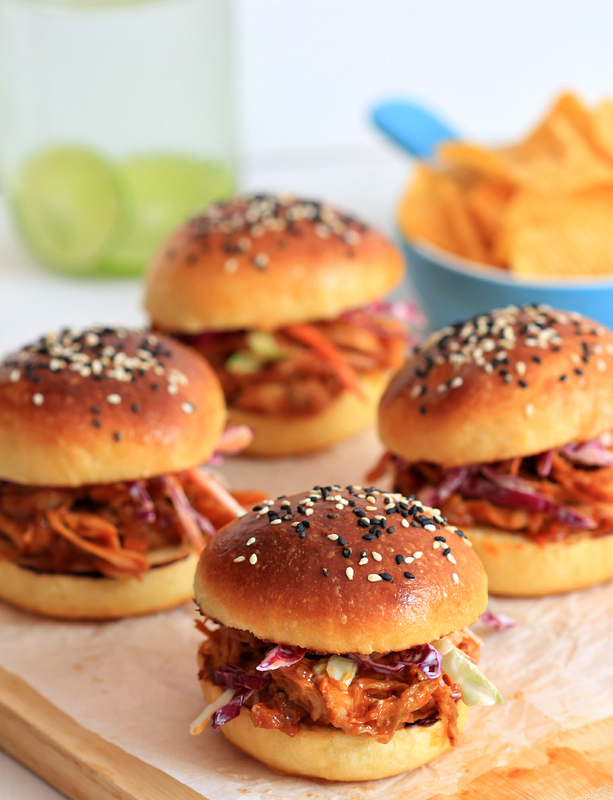 I like that you have baked brioche buns just for the pulled chicken. And the slaw is definitely a must here. Oh! They look so cute! 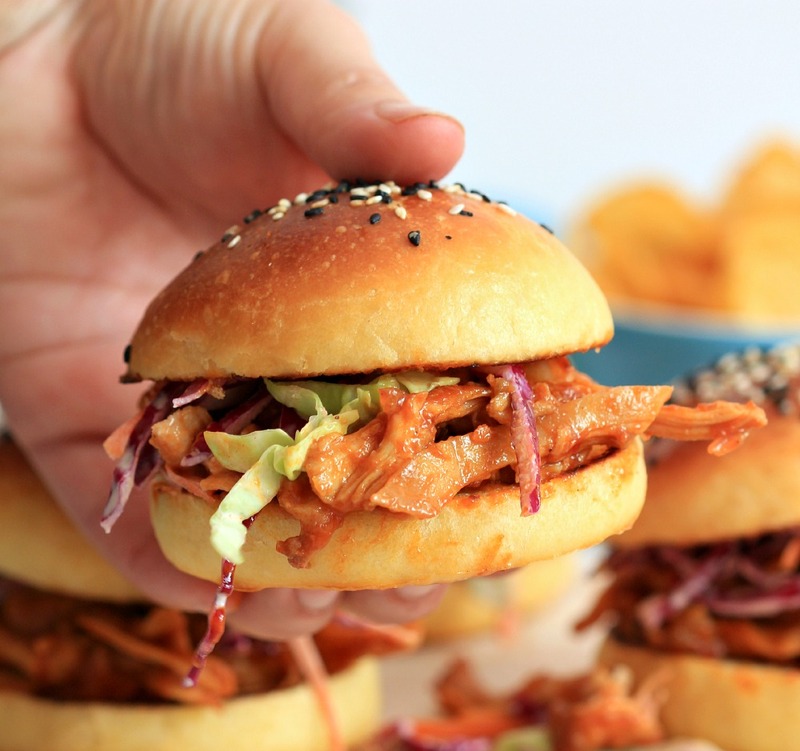 Your baked pulled chicken sliders are the best! Nice click and thanks fro sharing the wonderful and delicious recipe. I would definitely thrown in red Thai chillis or a bit of red curry sauce when I was making the chicken as I adore spiciness paired with something cooling like that slaw, but if I were serving it to my spice-phobe sister I would definitely follow this to the letter! oh dear! Oh dear! OH Dear! I'm late. I love your chicken slider burger, love the color, love the buns and definitely love the chicken slider.